I lived in Athens some years ago, and every weekend we would take ferries and small planes and head to the Aegean islands and remote coasts. 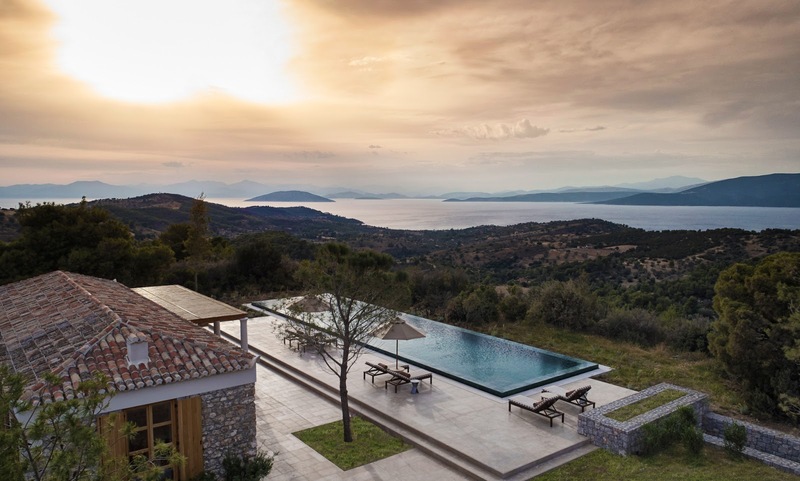 One region we loved, for its wild and craggy beauty, its deep coves, its archaeology, and its remoteness…is the Peloponnese peninsula, south west of Athens. 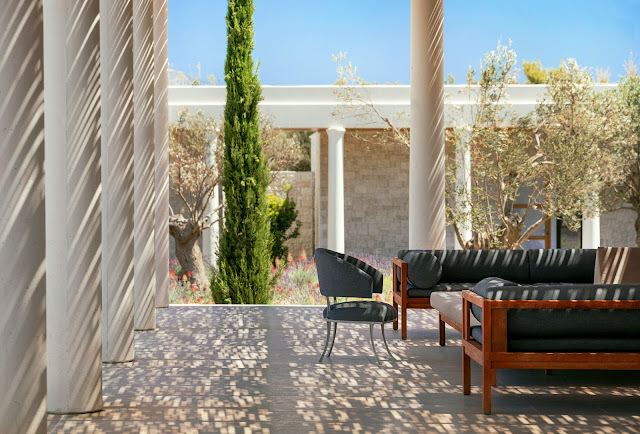 This week come with me to AMANZOE, the glamorous new Aman resort on the eastern Peloponnese peninsula overlooking the Aegean. 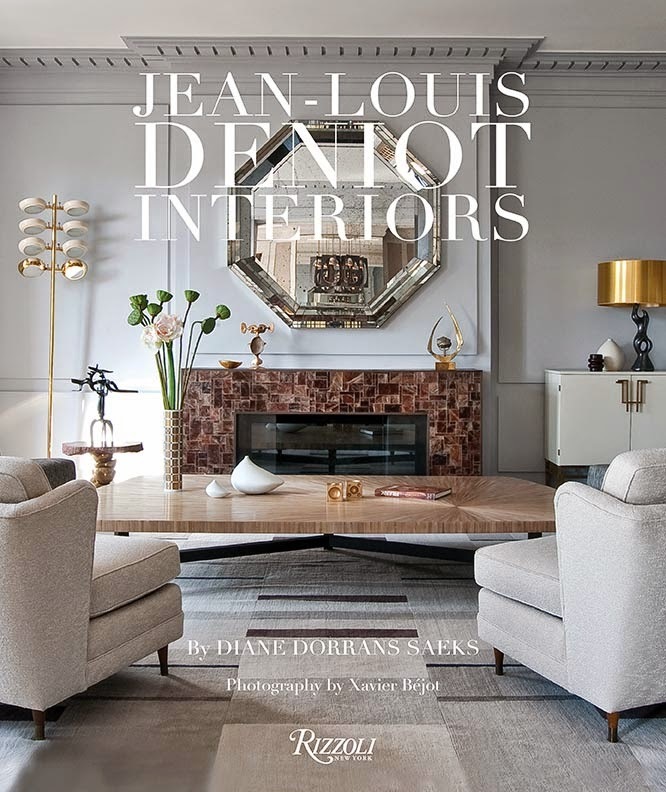 Its design was inspired by ancient Greek temples—and it’s a wonderfully private, pure, elegant escape with a fantastic sense of place. Come with me for a visit. 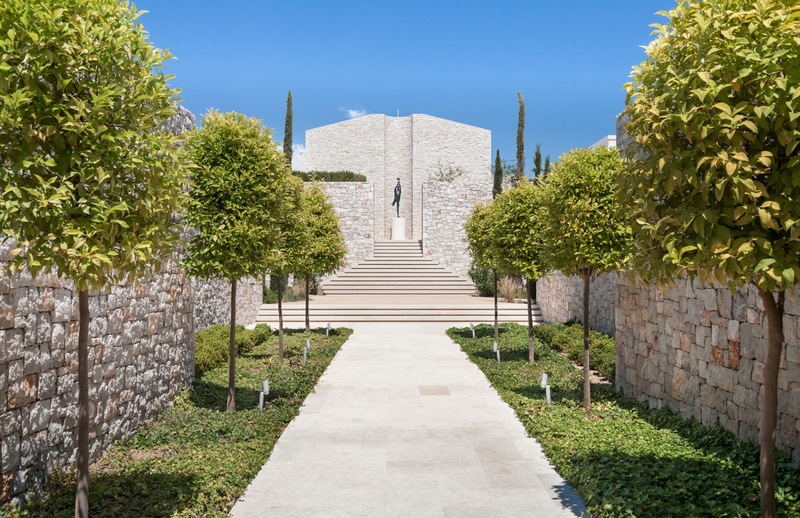 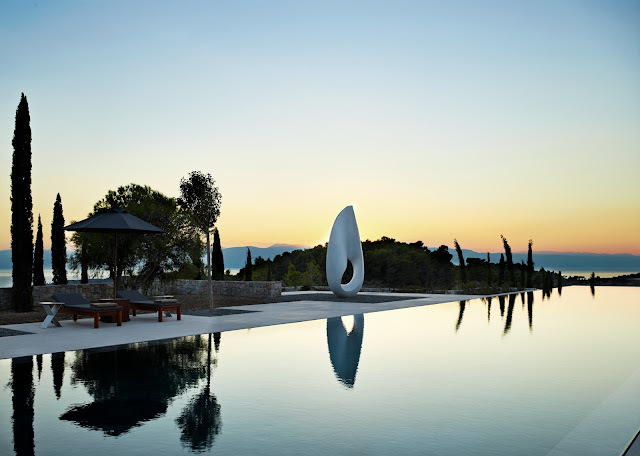 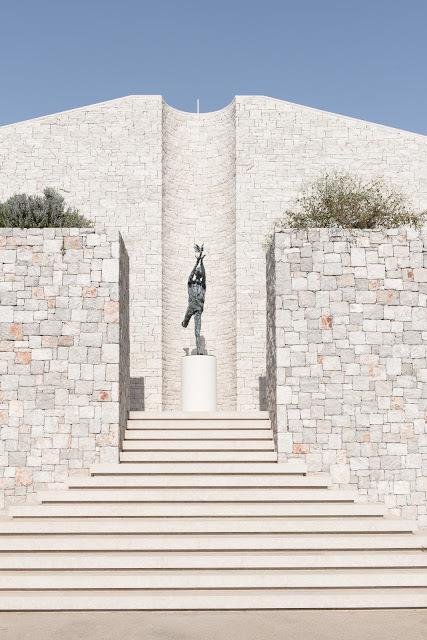 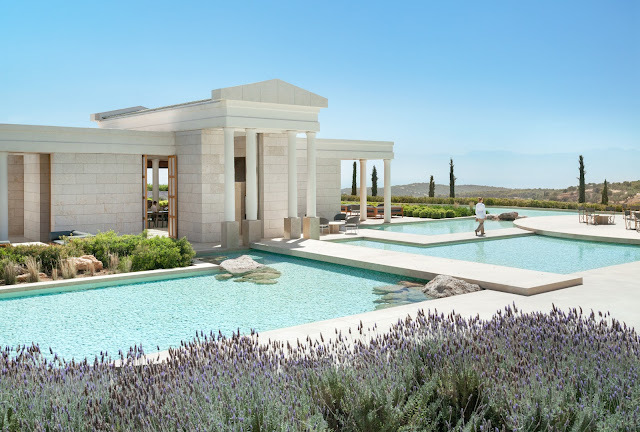 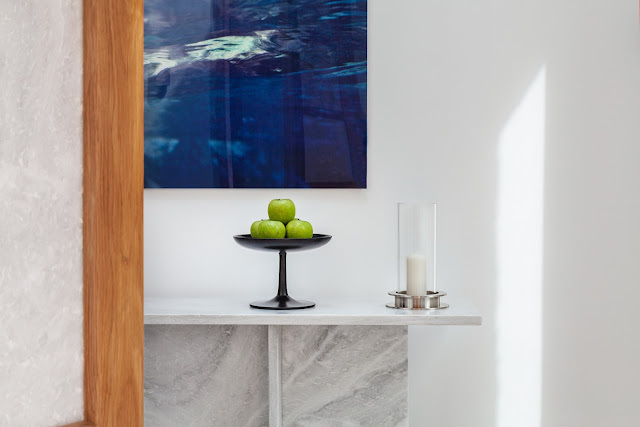 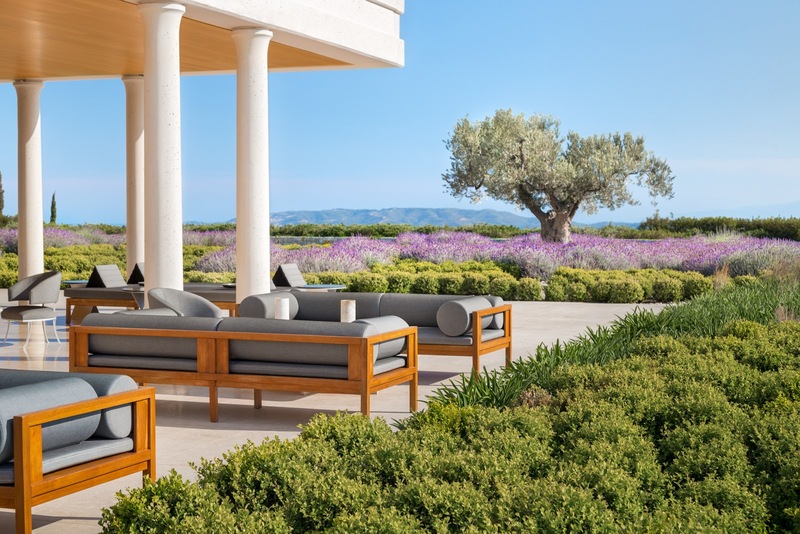 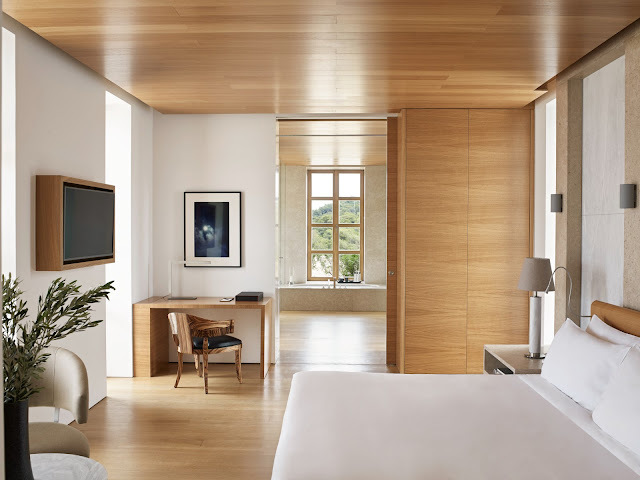 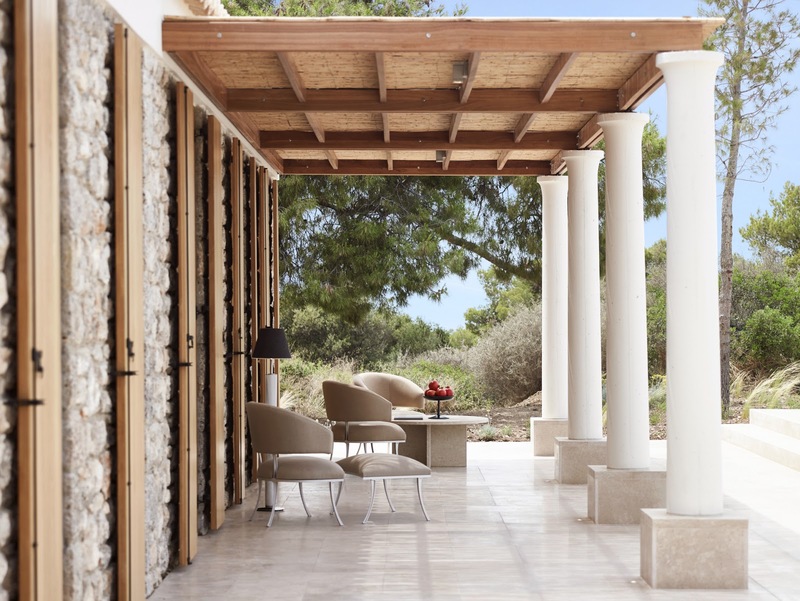 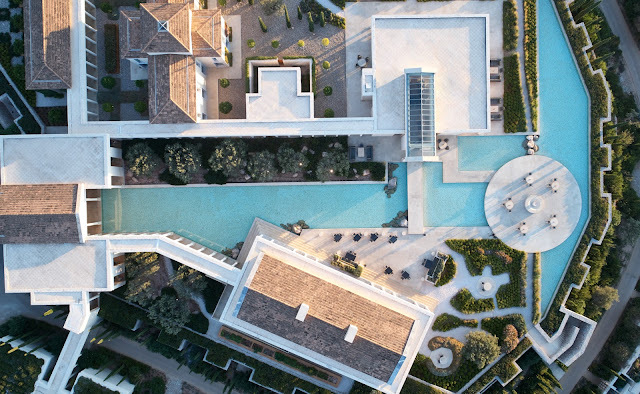 Remote, luxurious and superbly designed by American architect, Ed Tuttle, the new Amanzoe resort near exclusive Porto Heli offers an entirely new experience of luxury in Greece. 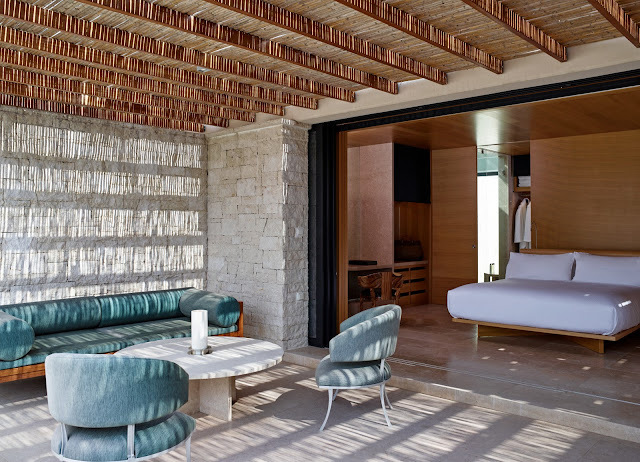 This discreet and tranquil Aman resort, which includes 38 suites, has panoramic views, dramatic landscapes and gardens, along with personal plunge pools and expansive terraces for sunset viewing. 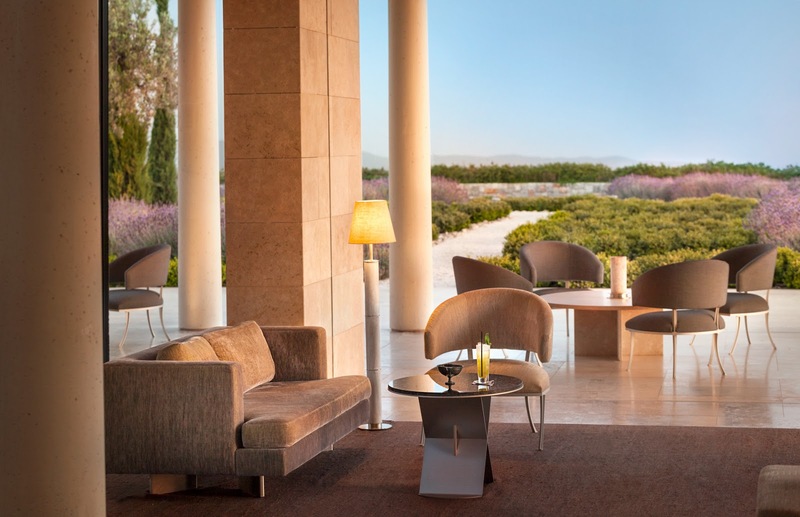 Amanzoe commands 360-degree views of the Peloponnese countryside and rocky coves and distant islands. 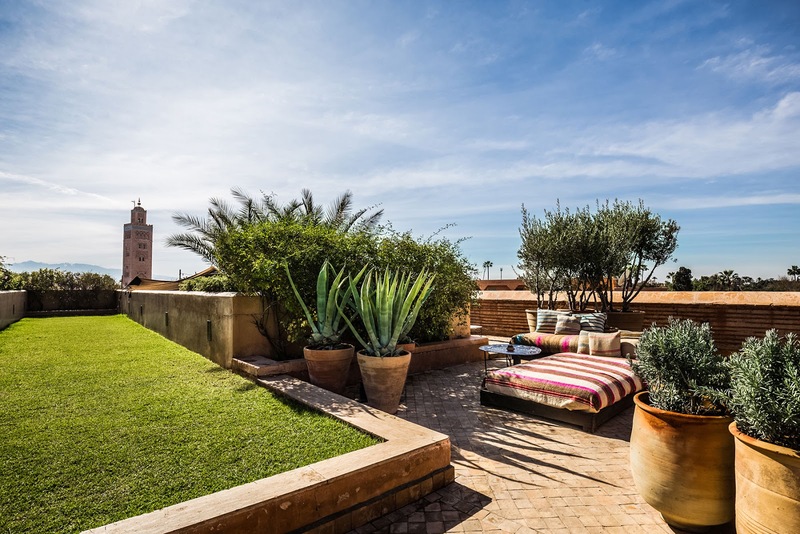 The property lies within easy reach of a wealth of archaeological sites. The cosmopolitan islands of Spetses and Hydra are enticing day trips. 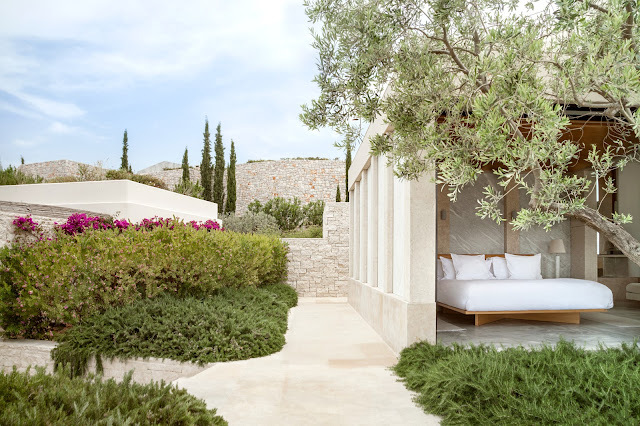 Lulled by the views, tranquil pools, and the lavender- and cypress-scented air, many guests never leave the Amanzoe property. 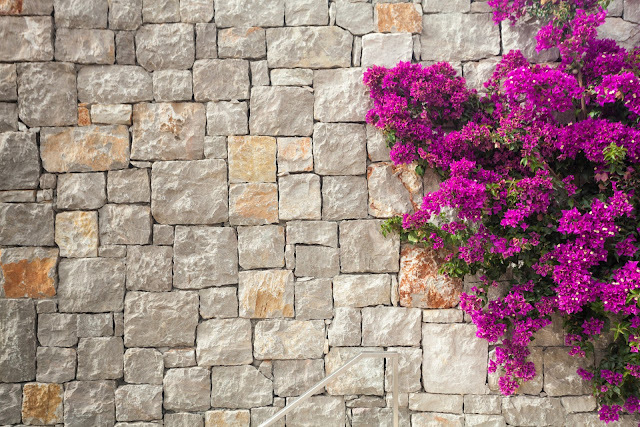 For those interested in Greek history, this region is rich in historic chapels, and significant archaeological sites. 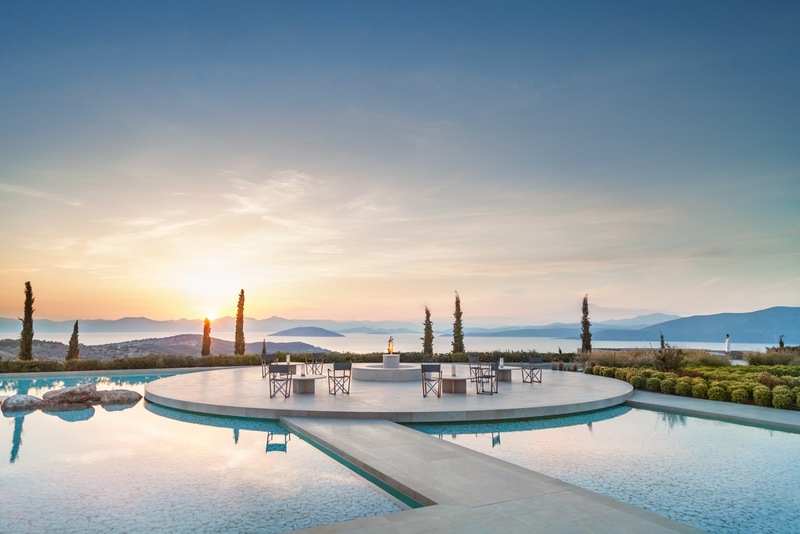 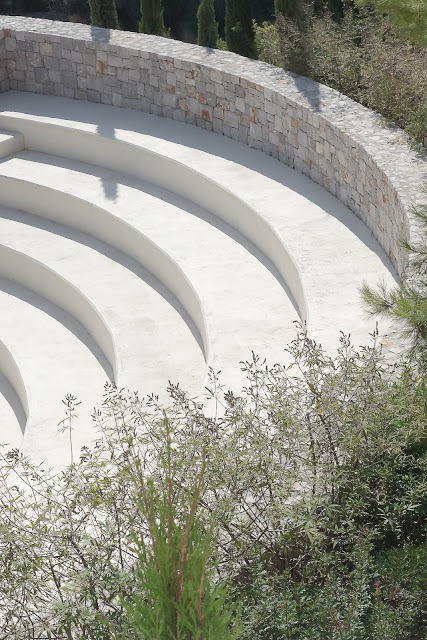 Amanzoe is a 50-minute drive from the ancient city of Epidaurus, a UNESCO World Heritage site, with a dramatic outdoor theatre still used for performances in summer. 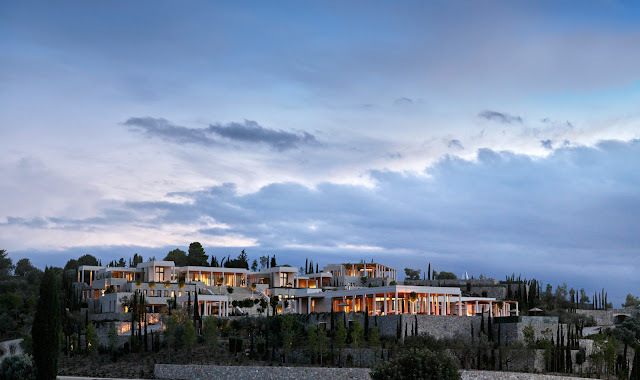 And a one-hour drive takes guests to the UNESCO-protected archaeological site of Mycenae, prehistoric kingdom of the mythical Agamemnon. Most travelers in Greece head for islands like Mykonos and Santorini. This new Aman resort entices with views of the Aegean and its ‘wine-dark sea’, lauded by Homer as his setting for ‘The Odyssey’. 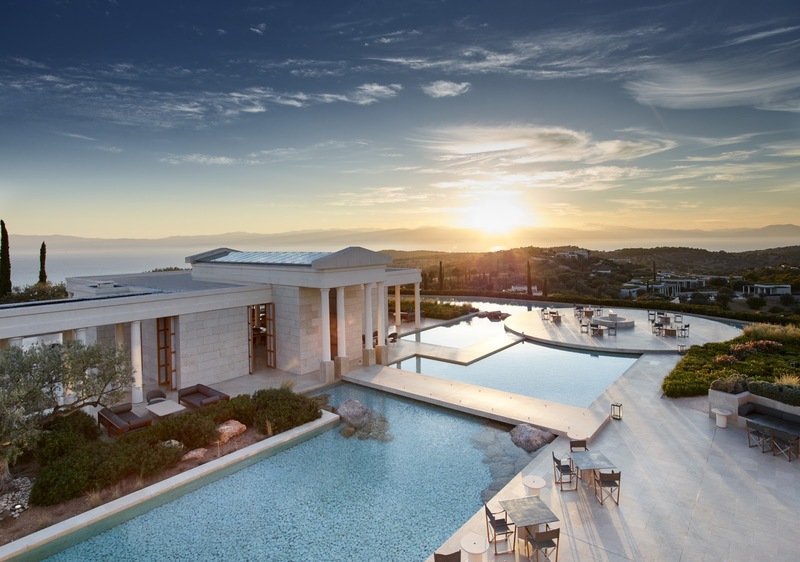 It is located on a hillside formerly a hideaway for European royalty on the 'Greek Riviera'. The resort is a three-hour car ride from Athens, or 25 minutes by helicopter. 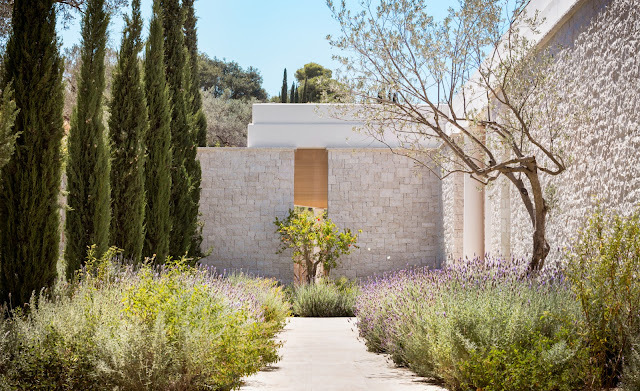 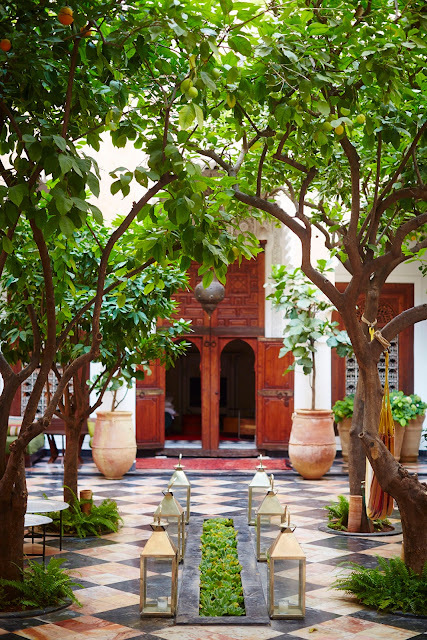 Family-style villas are discreetly secluded among olive and cypress trees and fragrant gardens of lavender. 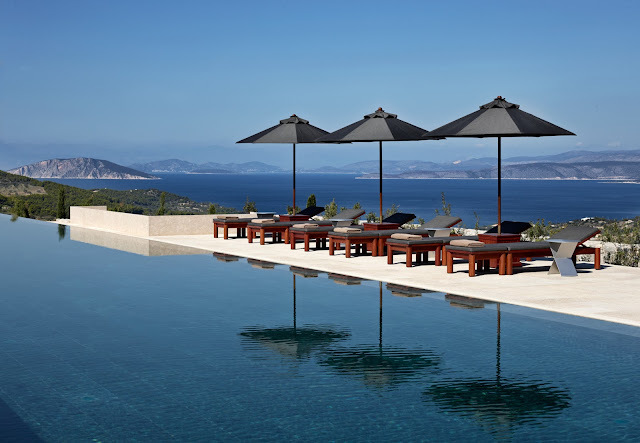 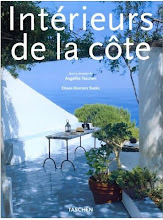 There is ranquil relaxation with views of pine-forest hillsides and citrus groves and sunlight flickering on the sea. 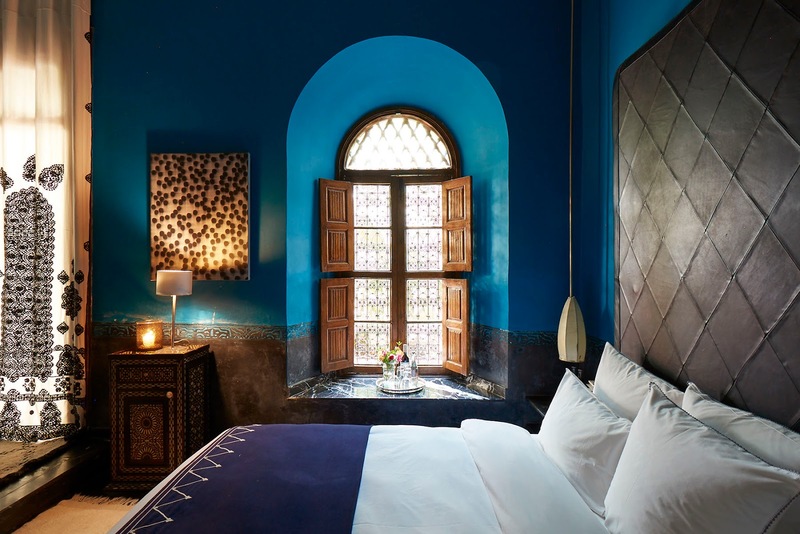 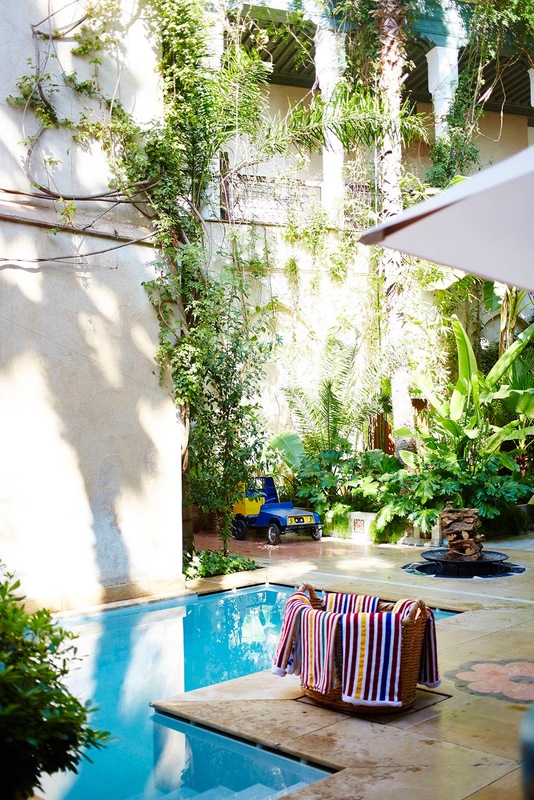 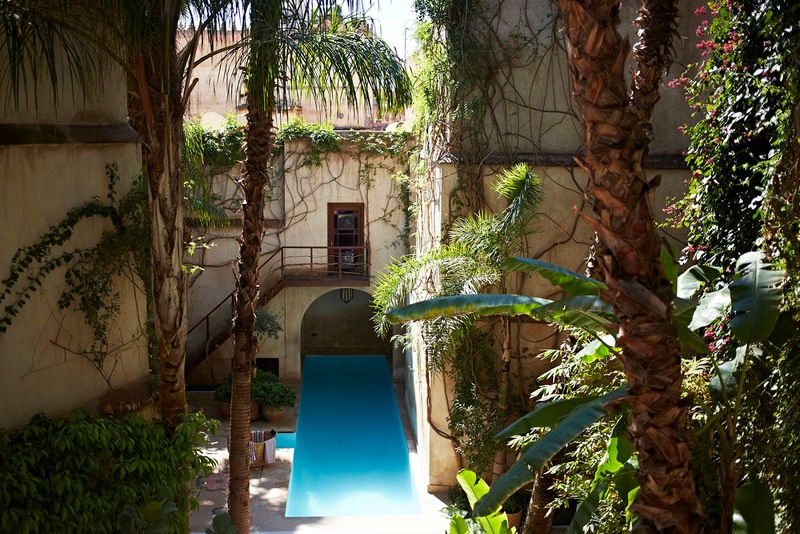 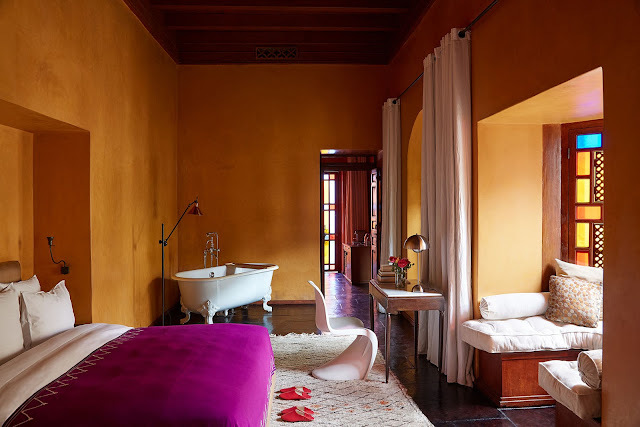 Rooms open onto private terraces for quiet sunbathing and an occasional dip in a private plunge pool. 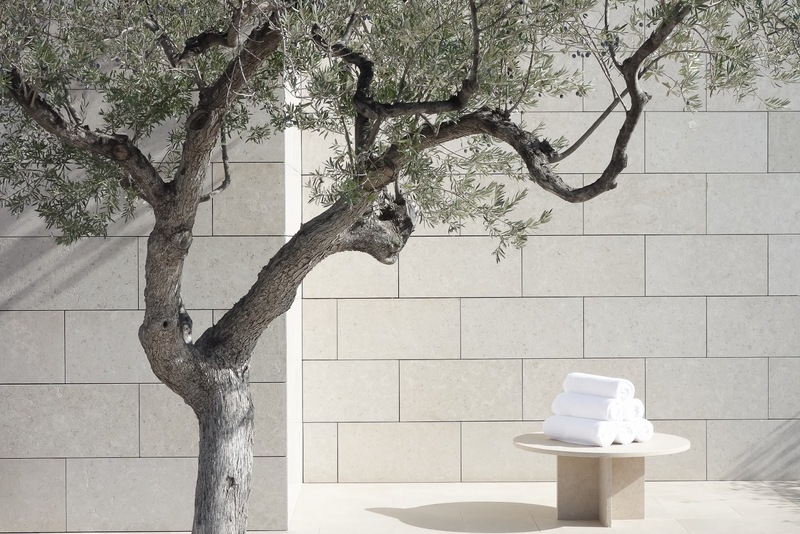 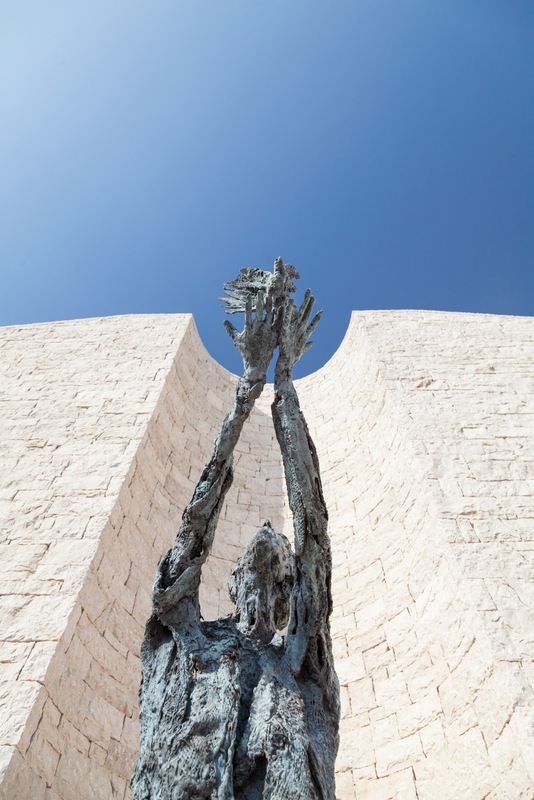 Amanzoe draws its name from the Sanskrit-derived word for 'peace' and zoe, the Greek word for 'life'. 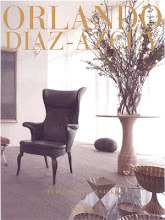 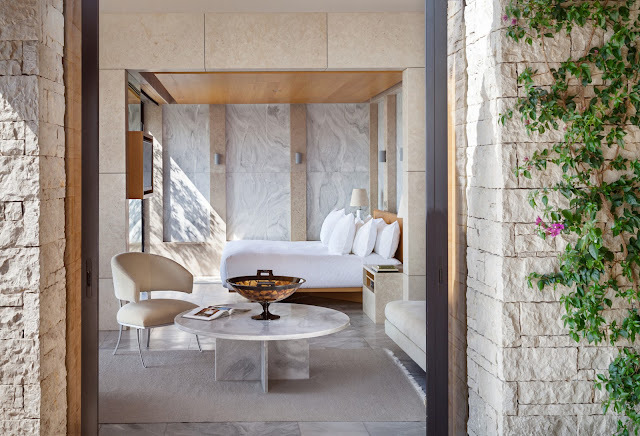 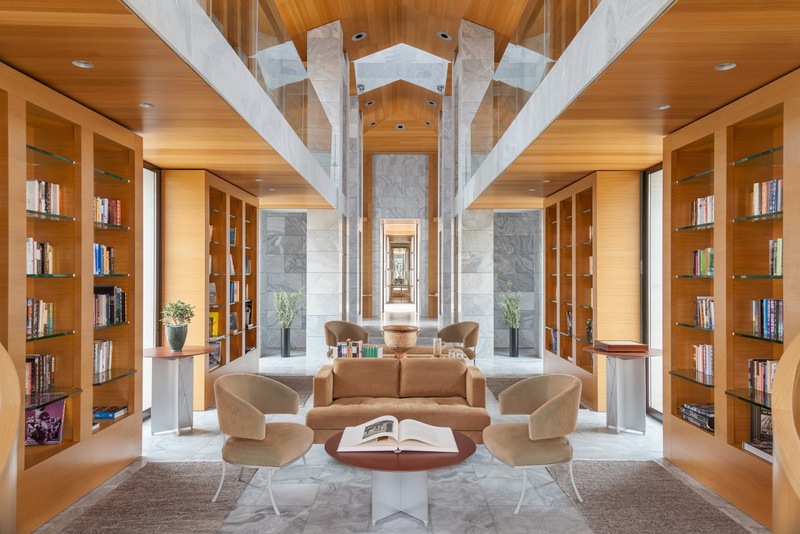 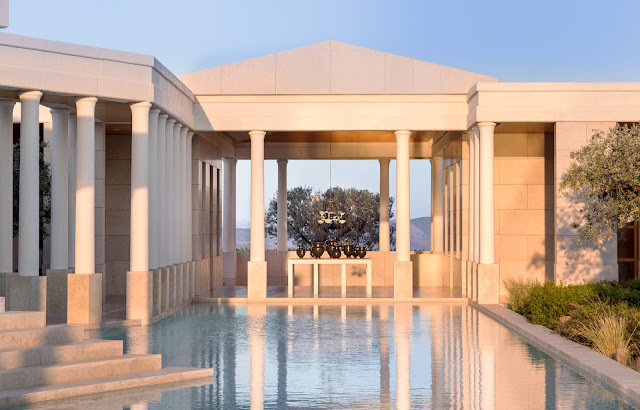 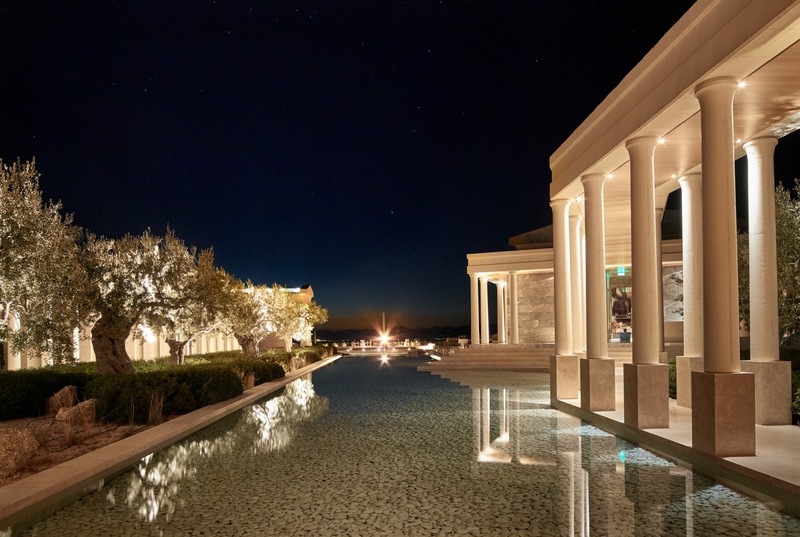 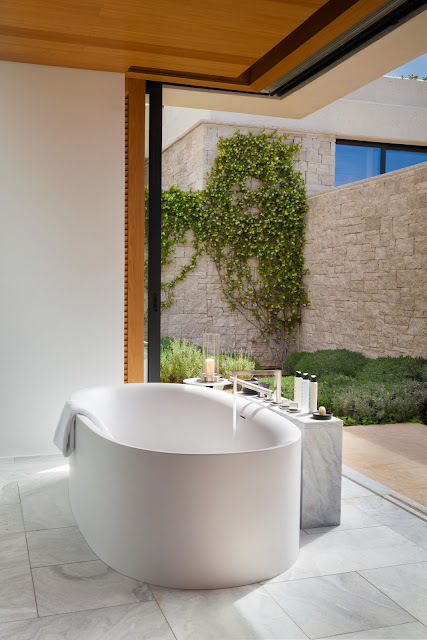 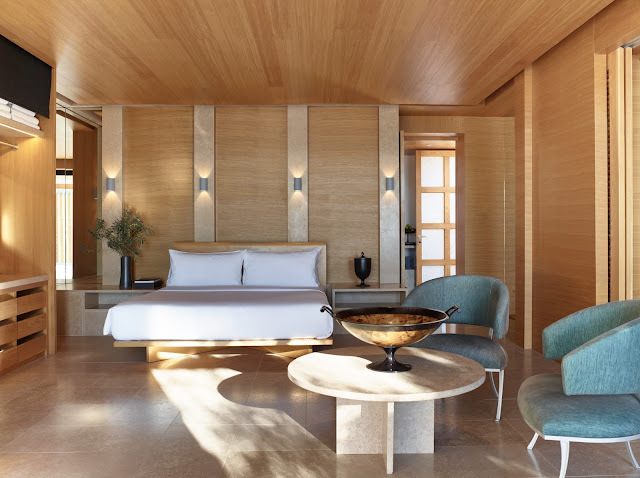 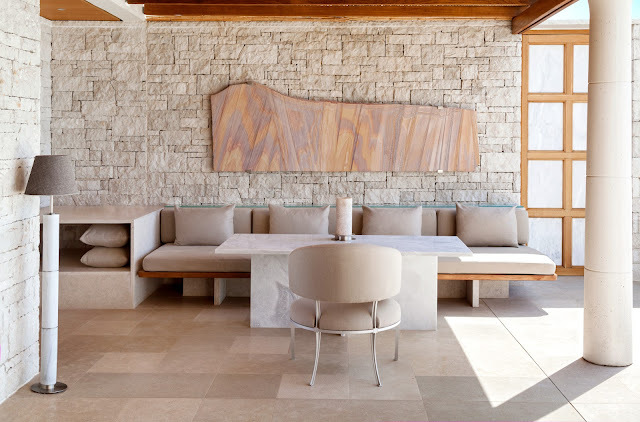 Los Angeles interior designer, Jeffrey Alan Marks, one of the popular stars of the hit TV show ‘Million Dollar Decorator, recently traveled to Amanzoe for his honeymoon. 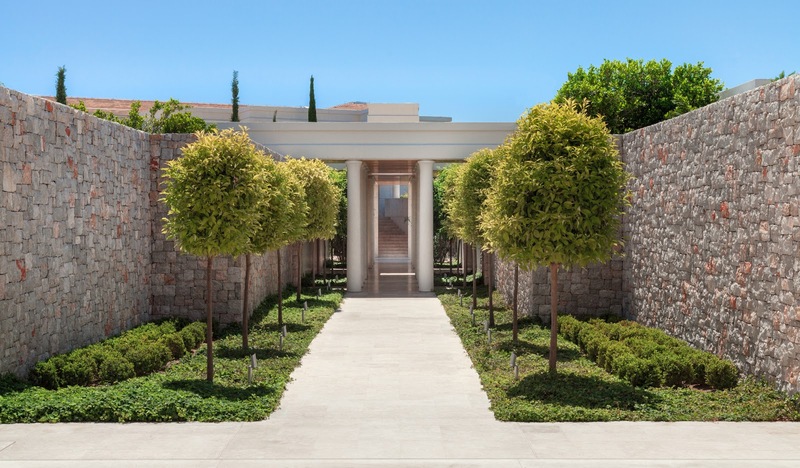 Marks admired Tuttle’s classical Greek-inspired architecture and the simplicity of the materials palette of pale grey marble and pale local stone. 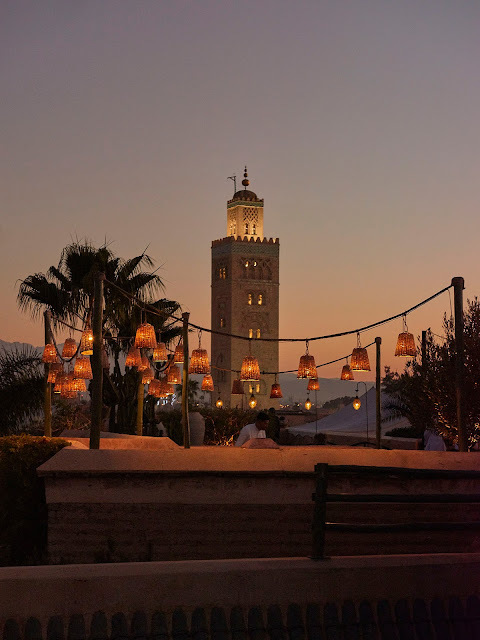 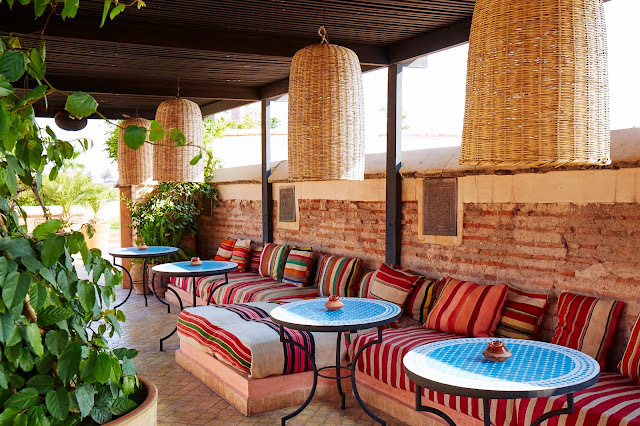 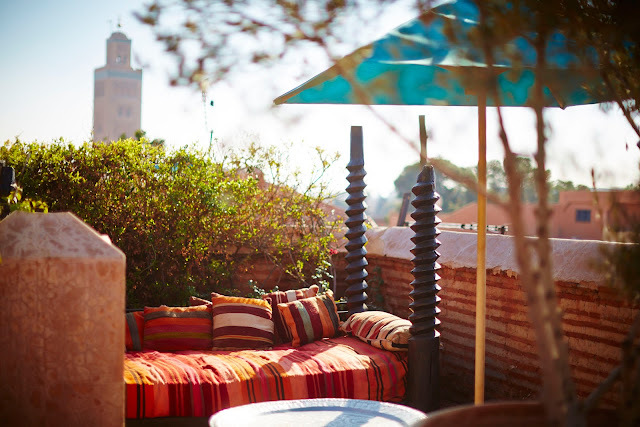 Guests dine on sheltered terraces as well as in many restaurants and bars. 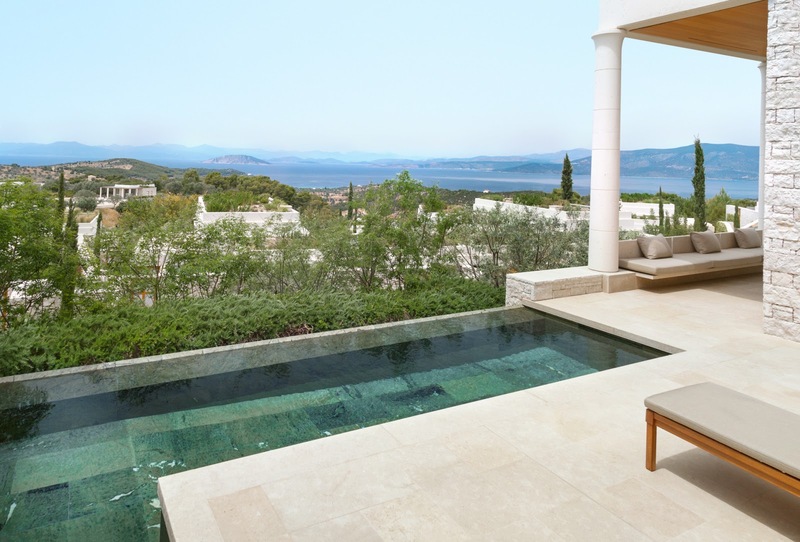 Suites include lap pools with magnificent views. 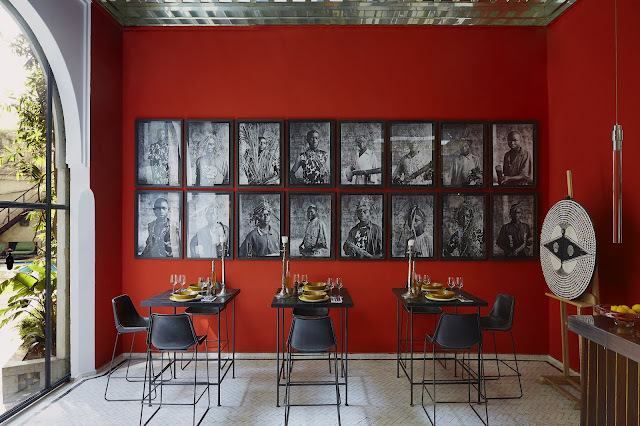 The Restaurant is open for breakfast and dinner, and serves Greek and international breakfast choices and Mediterranean dinner menus. 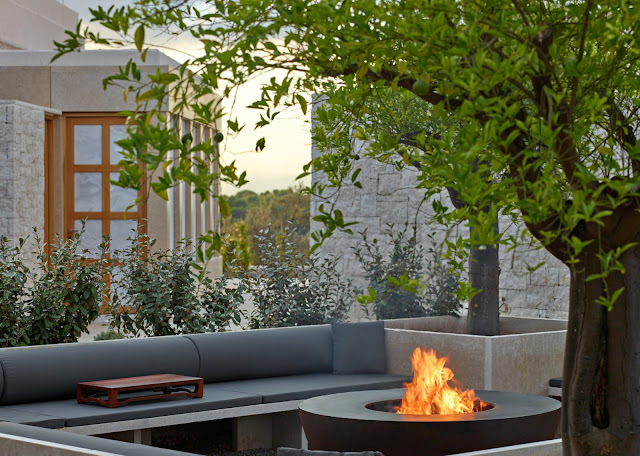 Fireplaces are lit during the cooler months. 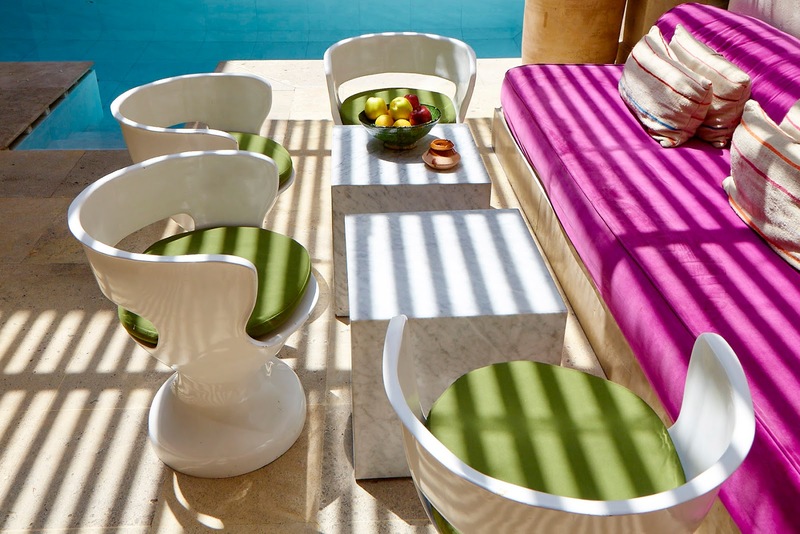 There are also an informal pool restaurant, the casual Beach Club, and a popular poolside Japanese restaurant. 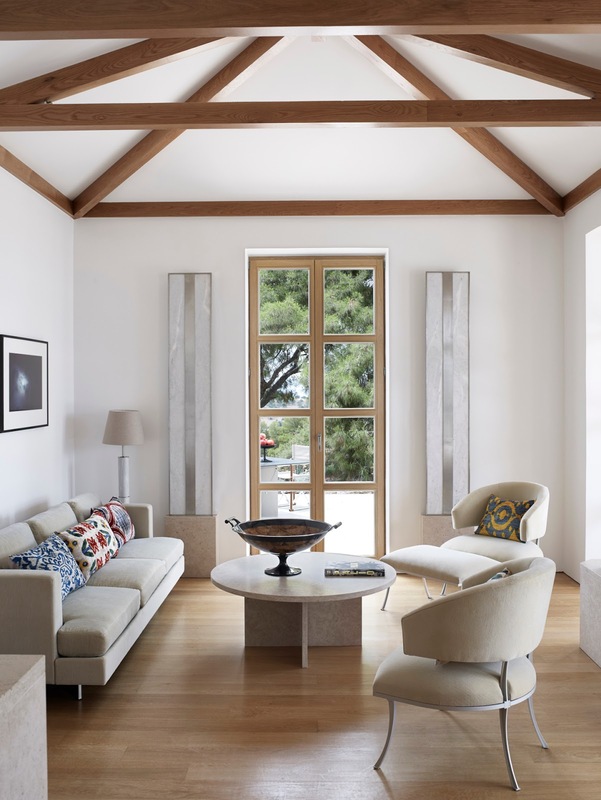 Views are always superbly framed. Summer in Greece can offer intensely hot days, and the hotel’s design includes reflecting pools and open pavilions, as well as shaded places for repose and scenic pleasure. 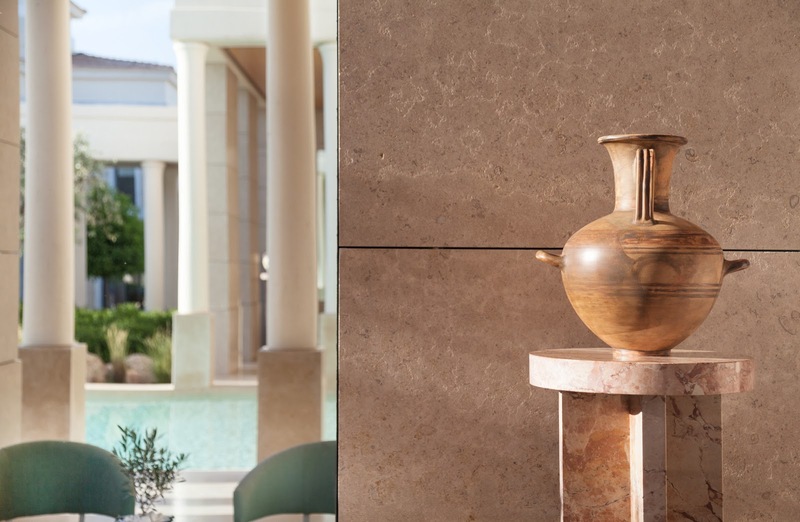 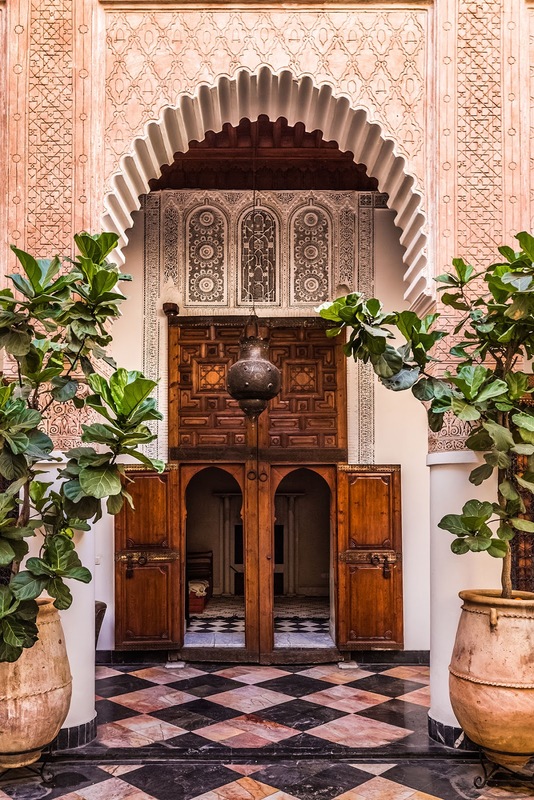 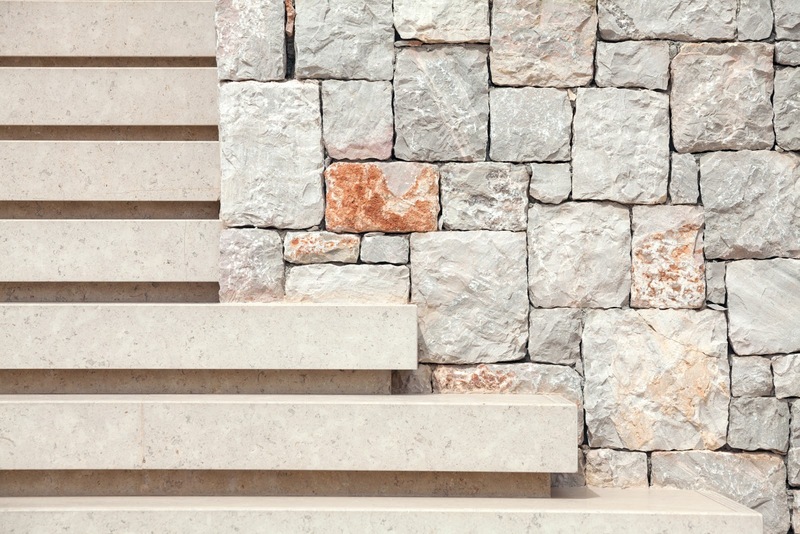 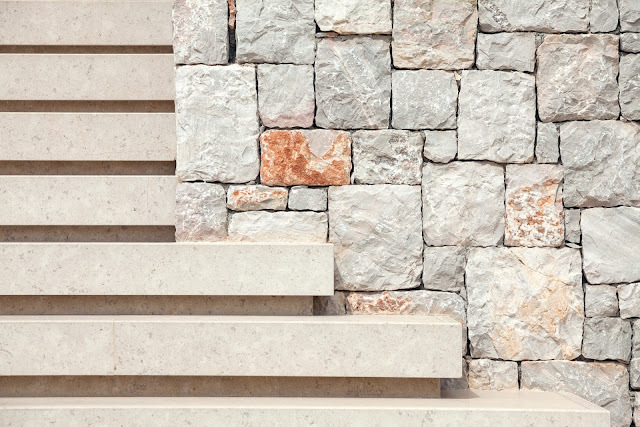 Local stone and marble were quarried and crafted using traditional methods to create walls, columns, and decorative accents throughout the resort. 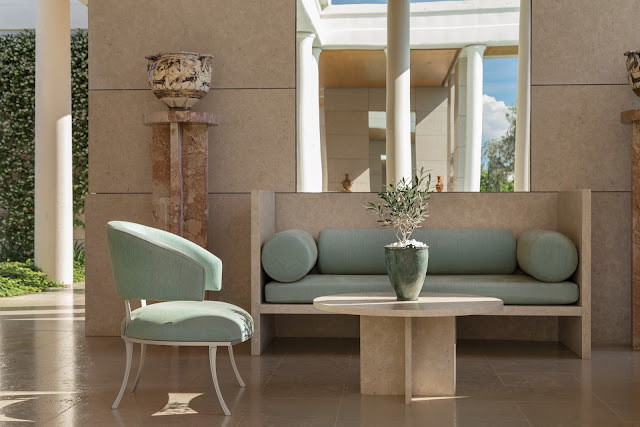 There’s a strong sense of place and Greek classical style. 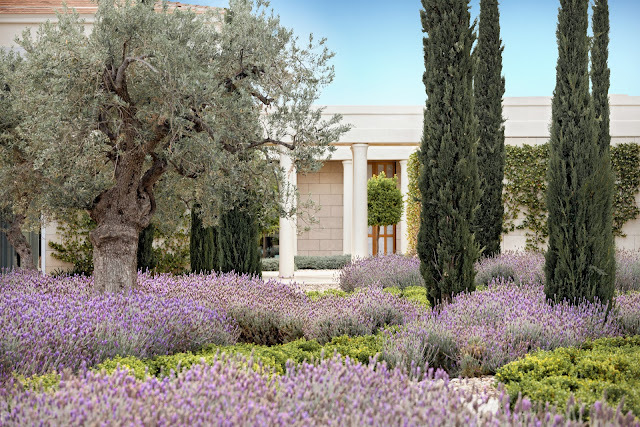 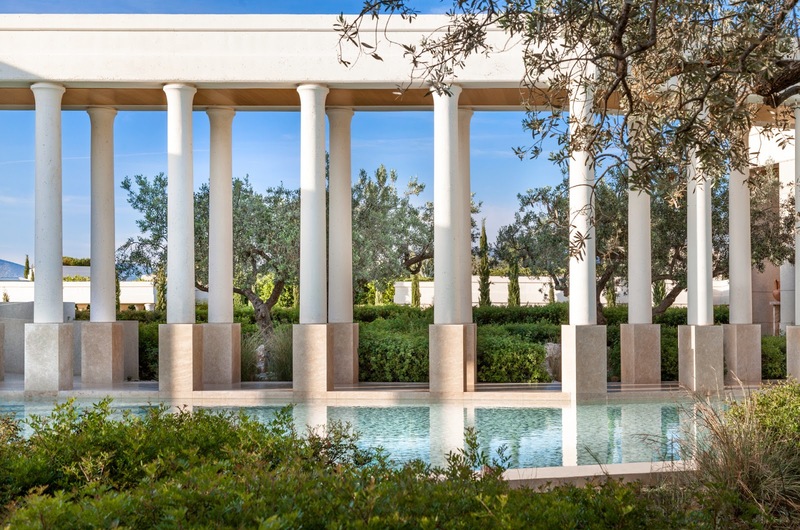 Olive and cypress trees were planted when construction began, and the property is textured with handsome mature trees that give the impression that the resort has stood on this regal site for many years. 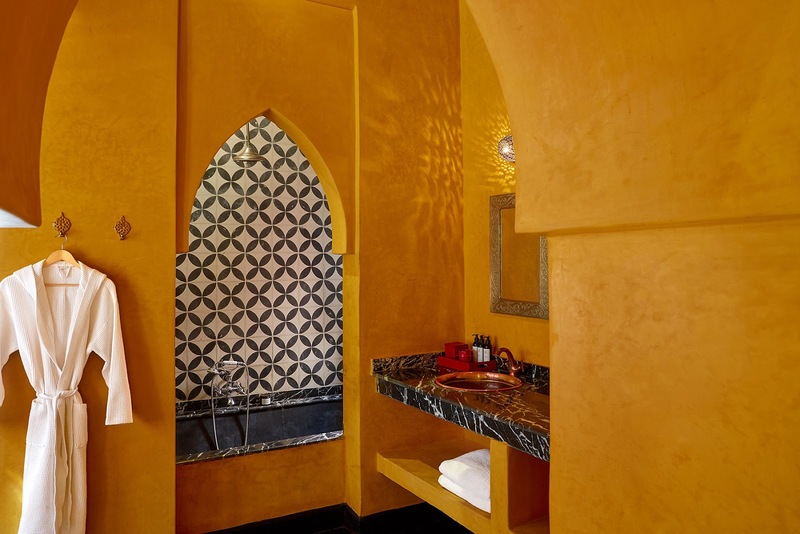 There is also a spa with double treatment rooms and steam rooms, a hammam, Thai massage room, watsu pool, a hair salon. 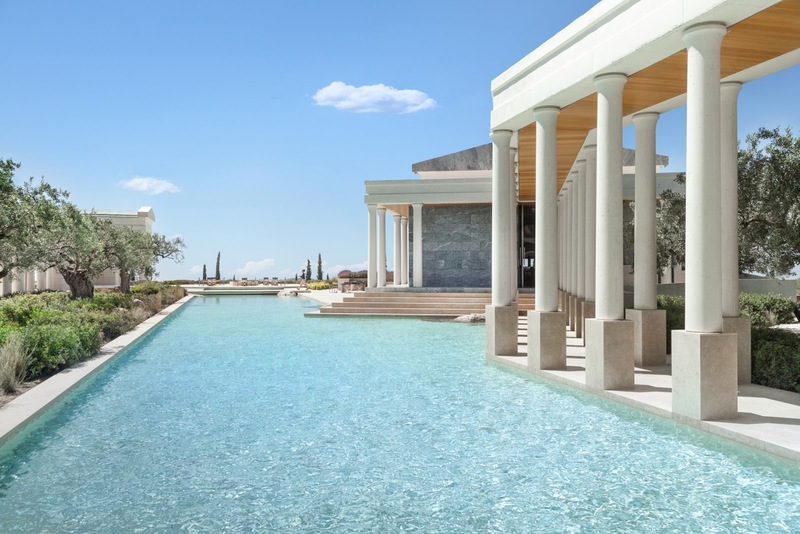 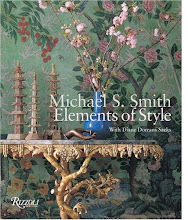 The extensive spa menu combined ancient Greek beauty rituals with Asian techniques. 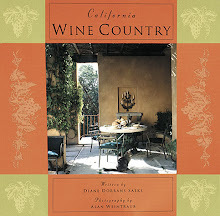 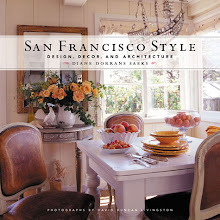 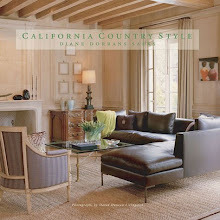 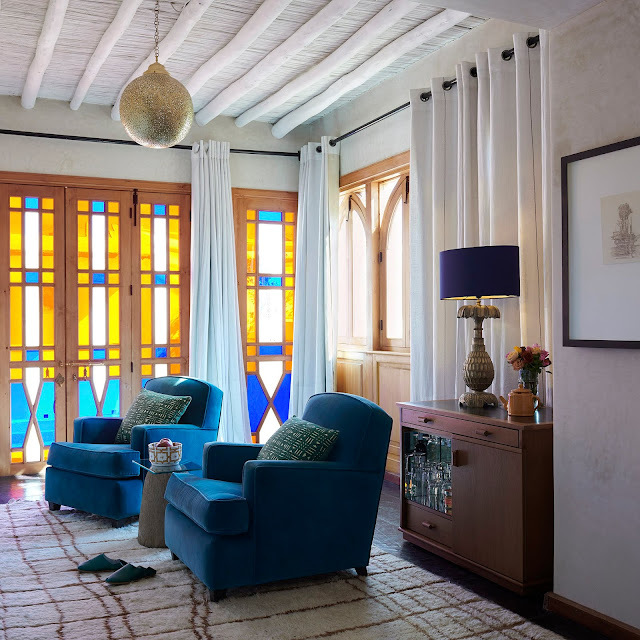 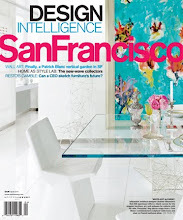 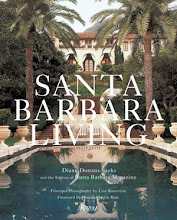 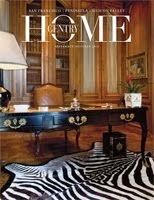 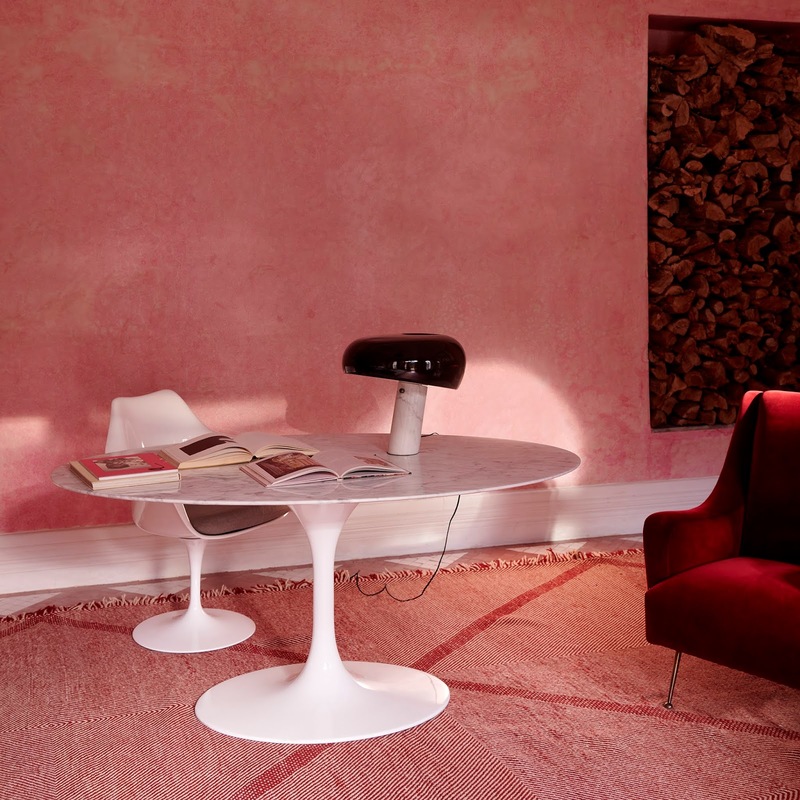 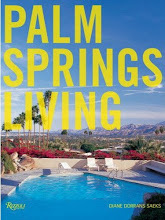 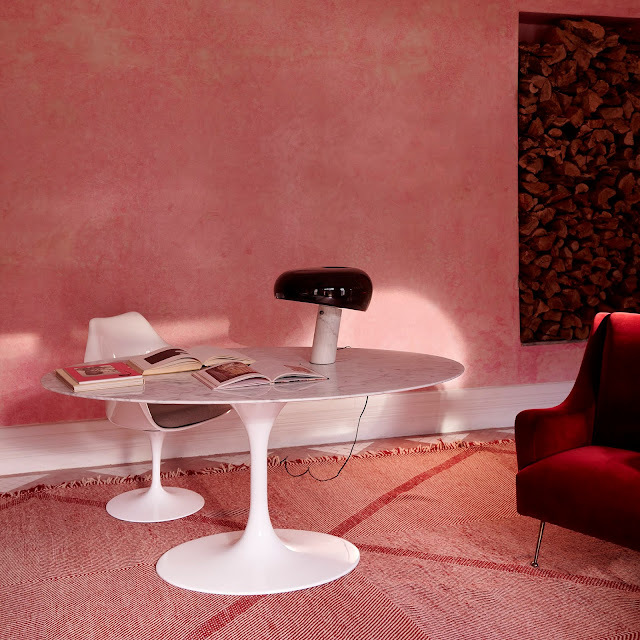 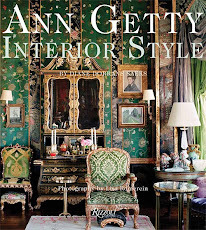 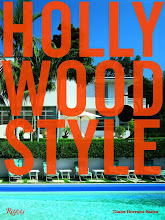 Perhaps most fascinating for Californians is that Ed Tuttle, the architect/ interior designer, grew up in the Bay Area. 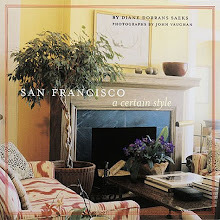 After studying architecture, he apprenticed with the Gump's design studio in San Francisco. 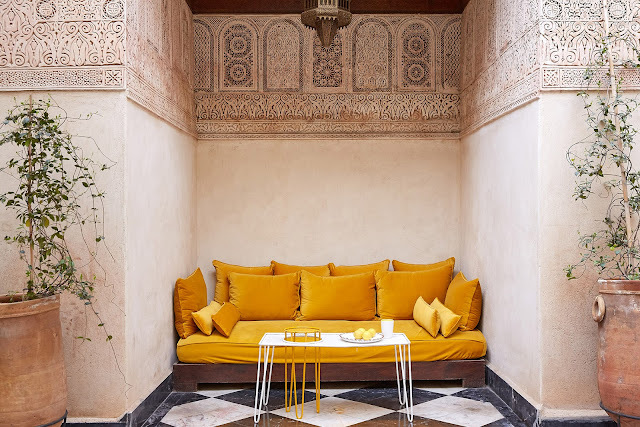 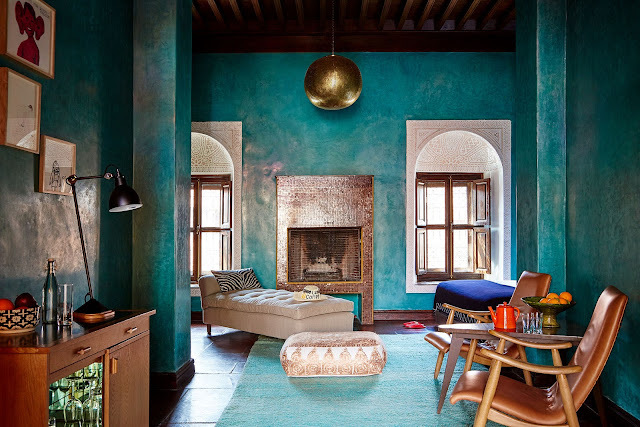 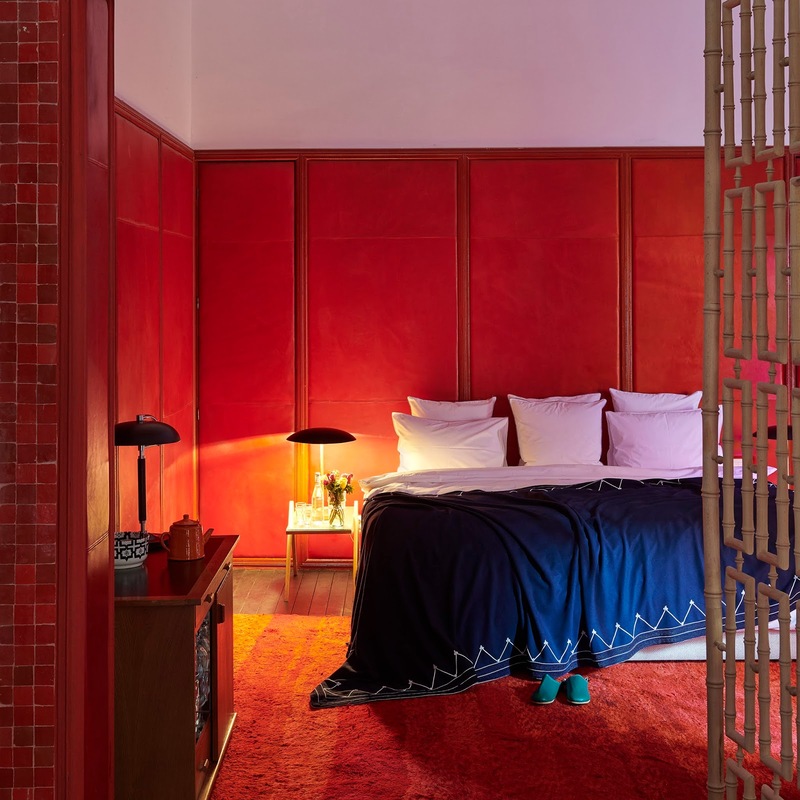 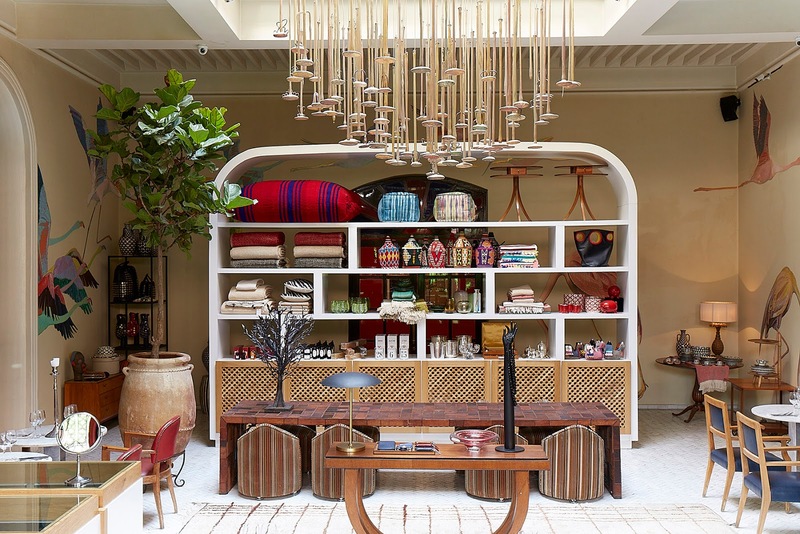 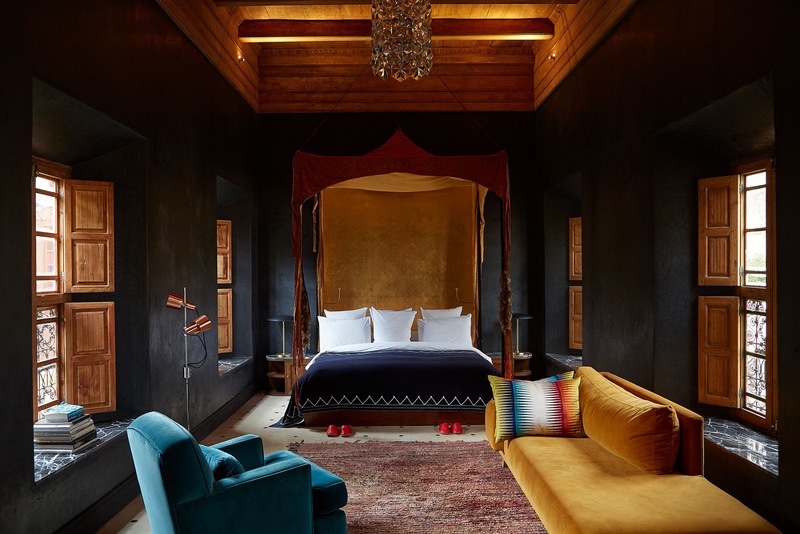 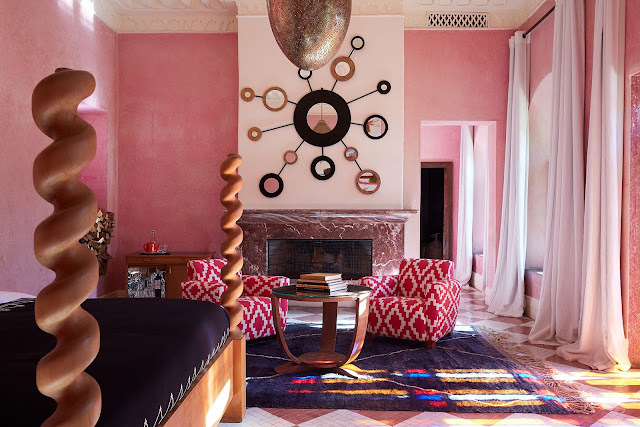 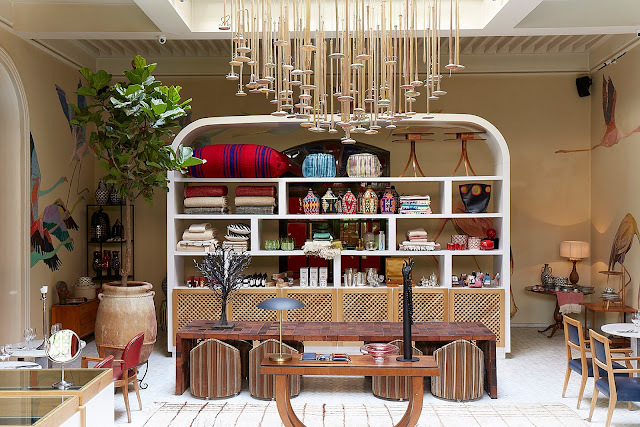 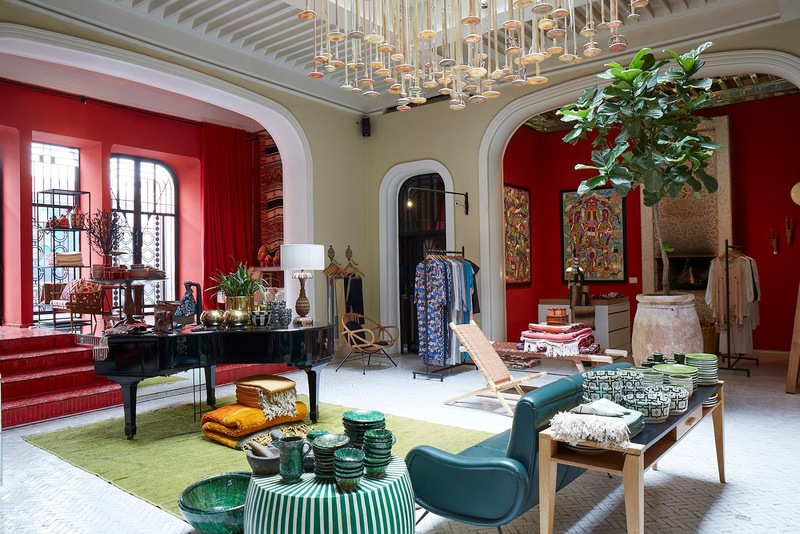 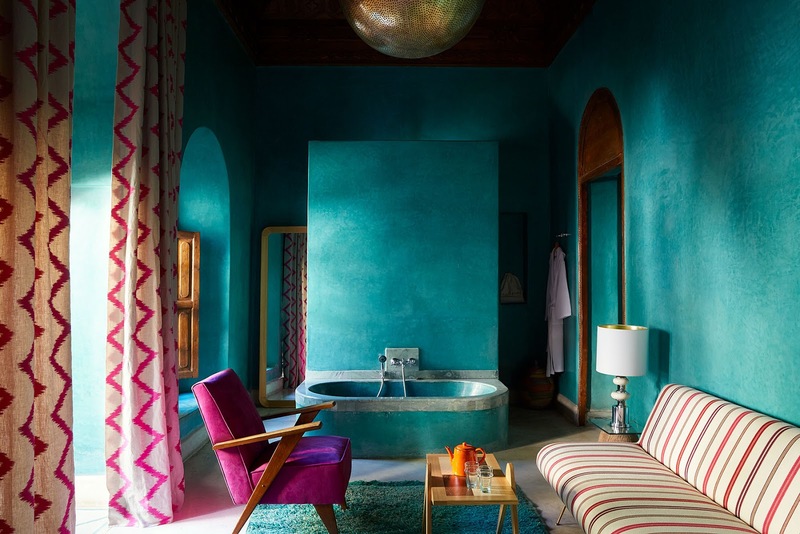 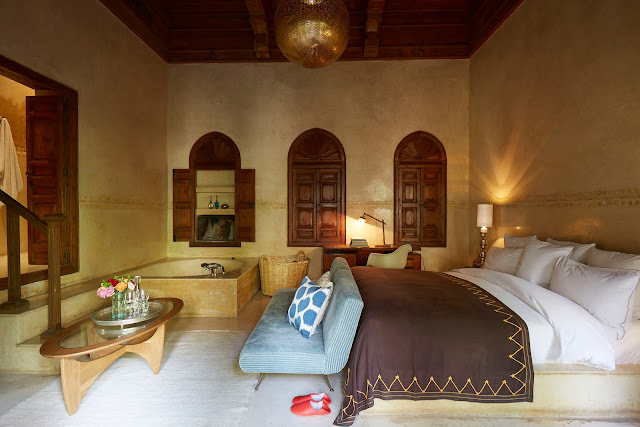 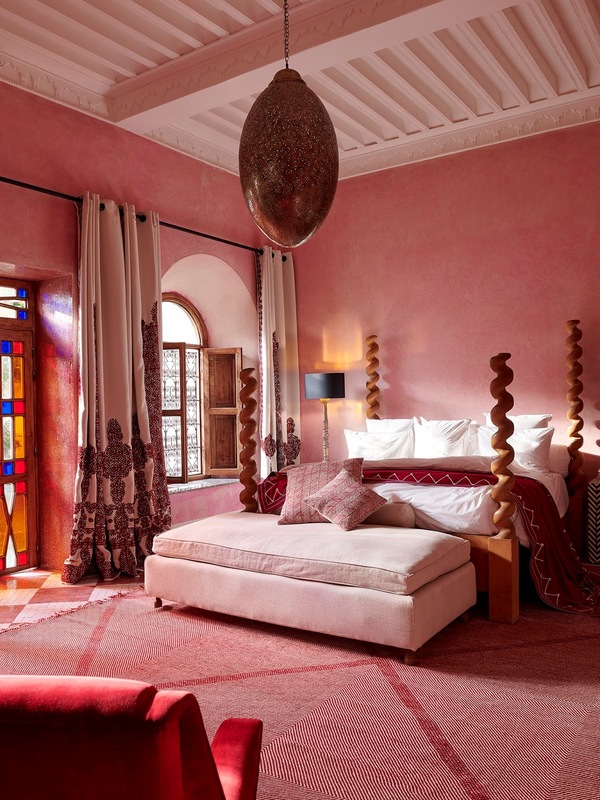 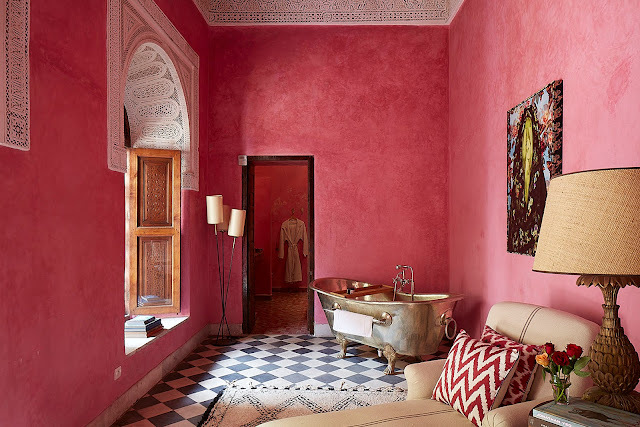 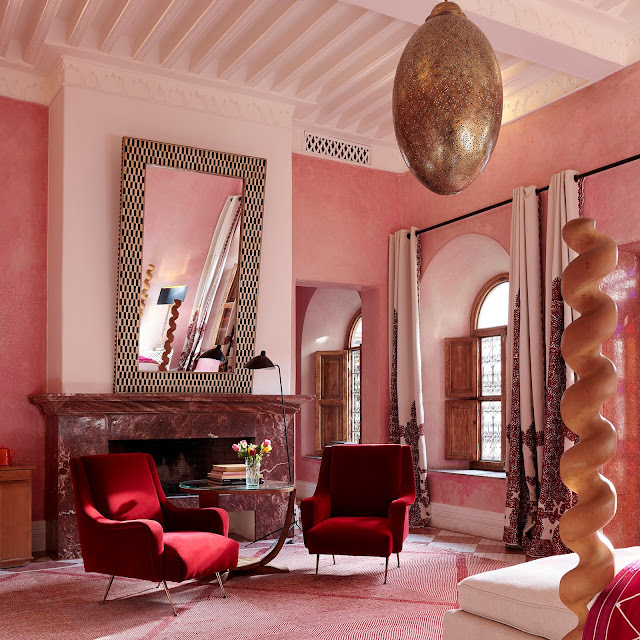 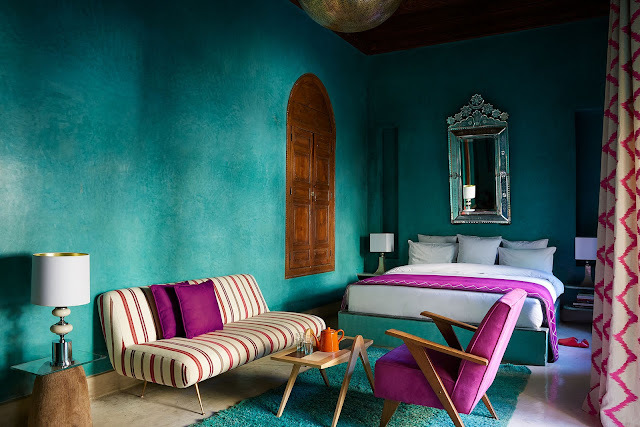 In recent decades Tuttle, based in Paris, has made his mark designing Aman resorts in India and Bali and throughout Asia, always working in the design and architecture vernacular of the region. 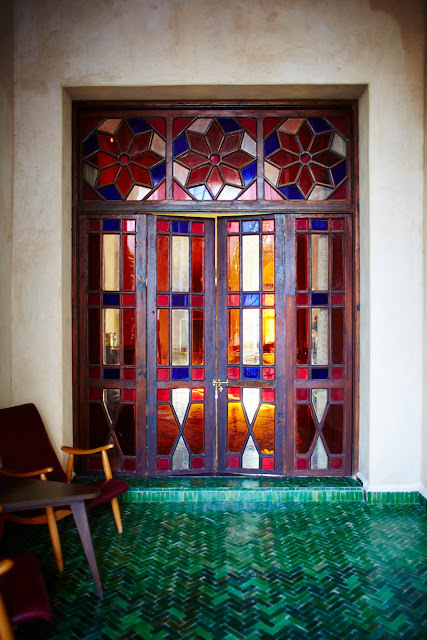 Tuttle worked closely with local crafts specialists and artisans, and used local materials such as stone and timber, and techniques and styles that are particular to historic and contemporary architecture of the region. Families and groups of friends enjoy the serviced 4-6 bedroom villas with spacious terraces and a very residential relaxed feeling. Each villa comes with a private chef. 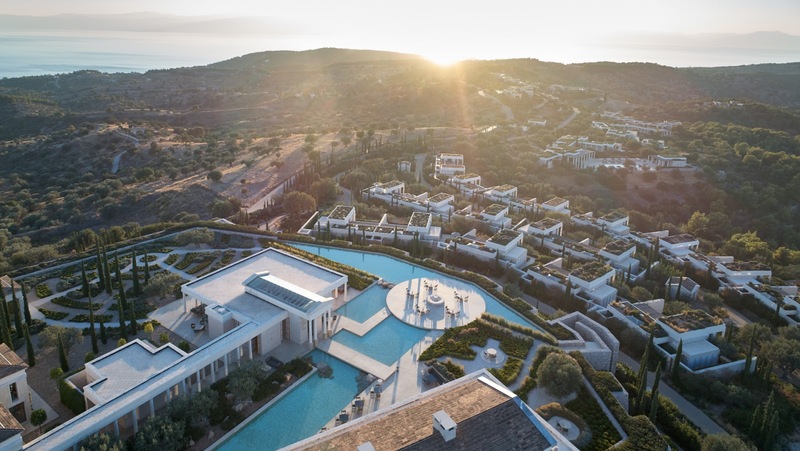 Although it is a discreetly small resort, it offers a private beach club, speedboats for island-hopping excursions, two swimming pools, a gym, a spa and yoga studio, tennis courts, a boutique, a library. 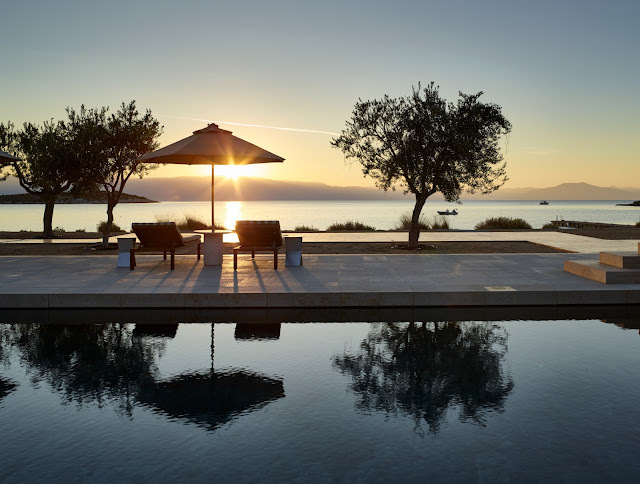 The eastern Peloponnese constellation of inlets means the water is calm and less wind-swept than other island groups. This is Greece’s largest wine and olive producing region and also home to UNESCO World Heritage sites including the wondrous amphitheatre at Epidaurus and Olympia, birthplace of the Olympic Games. 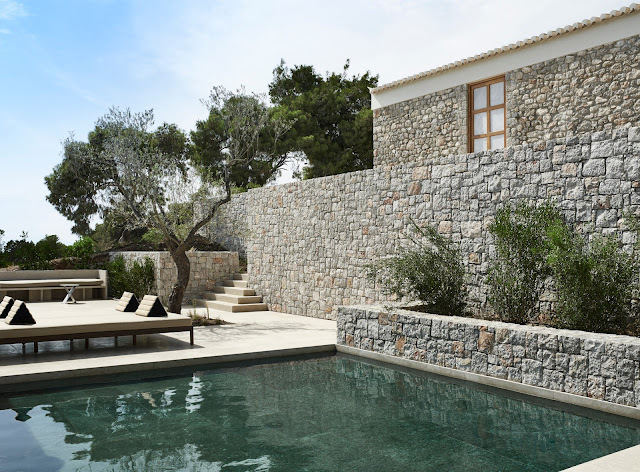 Porto Heli is surrounded by a rich agricultural region of Argolida, and it’s a locavore's dream. Resort restaurant vegetables, seasonal fruit, local wine and retsina, farm cheeses, fish, olives, and olive oil and even the famous Greek honey, all come from the surrounding region. 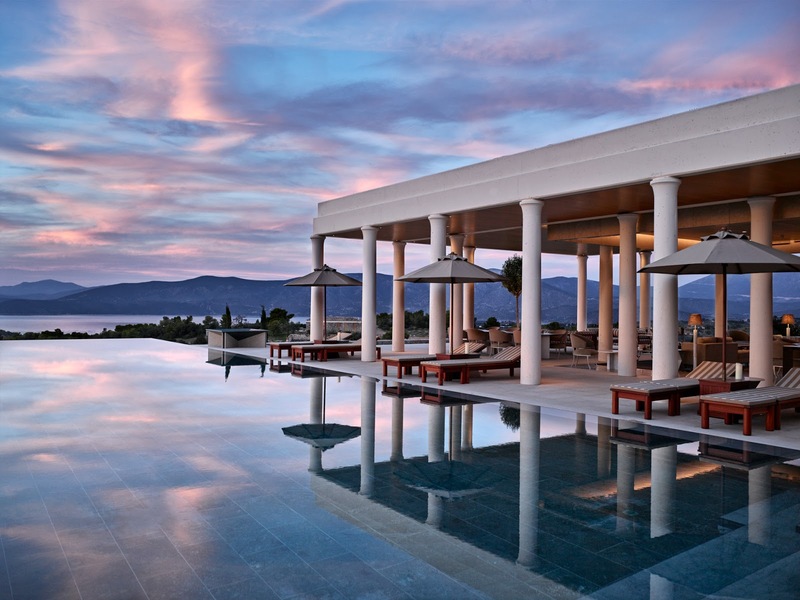 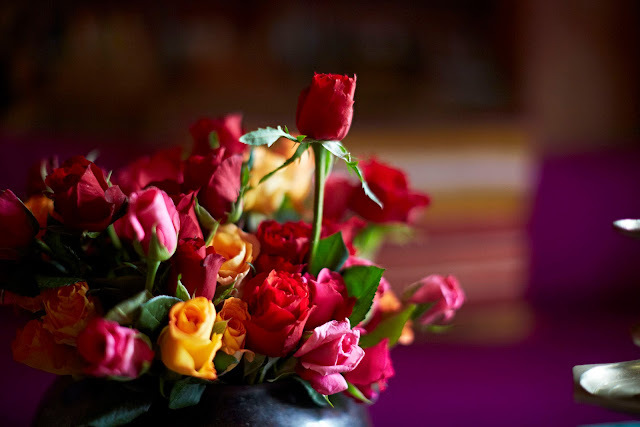 Photography courtesy of Aman Resorts.